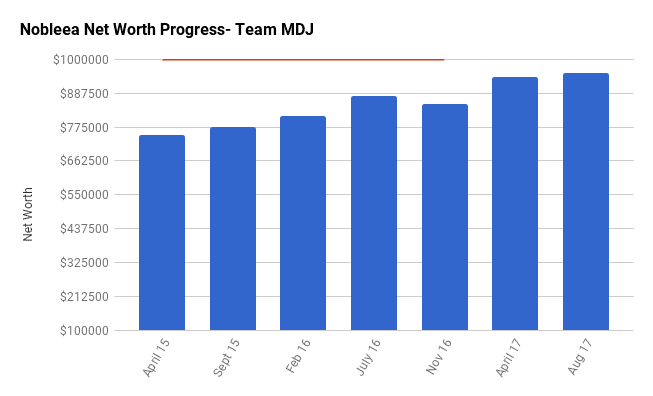 Welcome to the Million Dollar Journey August 2017 Net Worth Update – Team MDJ edition. A select group of readers were selected to be part of Team MDJ which was conceived after the million dollar net worth milestone was achieved in June 2014. Nobleea – the Oil and Gas Engineer, was selected as a team member and will post net worth updates on a quarterly basis. Here is more about Nobleea. Many changes behind the scenes since the last update, though they won’t show up on the NW statement until next year likely. As per my company’s plan, our furlough program ended at the start of 2017. They also re-instated our matching RRSP contributions and have indicated the first raises in 3 years will be coming in early 2018. My wife will head back to her job in September at which point our son will be 9 months old. We will have a fair amount to pay later this year when we get the pension service buy-back letter for my wife’s maternity leave. I would estimate somewhere between 15-20K. There is still some EI parental leave available to me if I want to take some time off later in the year for a bit and that is an option we are considering. We started an RESP for our son as soon as we could. Combined, the two kids have a total RESP balance of about $16,700 though the value is not included below. It is invested in TD e-series. Our oldest is 3.5 and youngest is 9 months. When the balance exceeds $35,000, we will likely move it to a self-directed brokerage to save on fees. We managed to rent out our garage suite to a great tenant. They are just starting their PhD at the university, so that could be up to 4 years of a high quality, steady tenant. The suite and house are designed such that we never really see each other, so there’s privacy for everyone. As mentioned in our last update, we’ve embarked on our first residential infill project. It’s something that I’ve always wanted to do and we’ve been planning on doing for a couple years now. We closed on a tear down in May in a very nice neighbourhood and have torn it down and split the lot. I’ve completed the house design and material selections and we’ll be breaking ground in mid October on two houses. The builder we’ve selected will be buying the lots from us at market value and we’ll sign an agreement to buy the finished house off them. This gets the property off our books and crystallizes some of the gains in the 2017 tax year. The lot sale will likely close in November, so our next NW statement will push us past the $1M mark. When we sell the house in 2018, that will result in another small bump in NW, and another tax hit in 2018 tax year. I am estimating a gross profit of 50-125K per house with the most likely value around 85K. We have a partner who is purchasing one of the houses. For now, I have only included our net equity in the lots to simplify reporting. The housing market is still ok here, we never saw a huge run-up like other cities, and despite what is heard about the oil industry, employment here is still pretty stable and in fact trending up. As this is a first-time project for us (our partner has done this successfully many times), I am keeping track of hours spent on it as well as expenses by date in order to generate a true XIRR of our investment (how to calculate XIRR with excel) and hourly rate of my time. We are running this as sole proprietors until we confirm that it works and that it’s worth our time. If successful enough, we’ll consider incorporating assuming it still makes sense given the changes the government is considering to CCPC’s. While designing and spec’ing the infill houses, I noticed a lack of well-designed home products on the market, at least in Canada. I’ve started investigating the potential in offering those as a separate business. The credit cards are paid off in full every month with no interest due. We put all our expenses on credit cards for cash back. As this can be a substantial amount some months, I believe it needs to have a line item in your monthly net worth as it is a liability at that snapshot in time. TFSA’s will need to be replenished over the next 5 years. We cleared out the non-registered account for the downpayment on the teardown property. We moved into our new build in July 2016 and have completed all landscaping. We have a 1BR suite located above our detached garage that is rented out. We own a lot that has been subdivided into two and will be built on this year. I understand the credit card debt, paying it off each month and big spending. Do you ever consider showing income earned and not yet received as part of your assets side? Sort of like accounts receivables. I wouldn’t do that for a regular job, but with my photography work there might be some value in that. Weddings for example are booked 8-16 months out, contracts are signed, deposits are paid. The amount is paid in full before the wedding date, but it’s pretty much guaranteed income as soon as the contract is signed. Ironically, I just had a bride cancel a couple weeks ago as they are no longer getting married. That’s what the non refundable deposit is for. That’s very rare. Wow so close to the million dollar goal! I’m leaning towards getting an RESP with the TD e-series too, that’s great that you got one started ASAP with your children. I would highly recommend taking some time off using EI if it’s financially feasible. I have taken parental leave twice and enjoyed it immensely (although sometimes it felt like more work). I don’t think you’ll regret spending some extra time with your children. Yes, I took some parental leave with our first child which allowed us all to go to Hawaii for a month. Our kids are already signed up for daycare, but I could take one or both out for some time, or even get a chance to get little projects done around the house that I haven’t been able to due to said kids. I’m pretty sure that you can re-start parental leave at any time in the first year. You might want to check that before your wife goes back to work. I seem to recall that it has to be consecutive. I did find a situation on the EI website where the mom was on maternity then parental leave, then went back to work, decided she wanted to continue with the kids at home and went back on parental. And that was ok as long as it was in the 52 week period. That’s a lot of real estate in that portfolio. Is that the best thing to have considering interest rates are rising, the new B-20 rules are coming and real estate sales and values are dropping like flies? Otherwise, good for you for growing the rest of your assets as you’ve done. Not looking to offend, it’s just that the huge real estate component scares me. Wow! First of all congrats on a great quarter – on track to your $1M goal. Its always great to see a fellow Canadian blogging in this PF community. Secondly, I would have never thought of renting out the garage suite. Talk about entrepreneurship! Lastly, after your infill project takes off, you’d see a huge difference positively impacting your net worth. Great stuff!